You can use the keyboard to operate DreamCalc either by using keystrokes or by putting the calculator into the key focus mode. For many common tasks, using keystrokes is convenient and natural. For example, simply type "5 + (3 * 72) =", and you will see the keys depress automatically and the input appear in the numeric screen. Keystroke input is not the same as "free text", however. 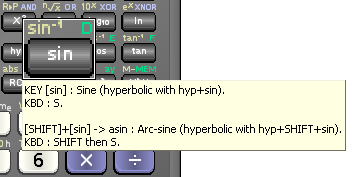 Functions, such as "sin", are accessed by single key press short-cuts rather than by typing the name (to input the sine function, you would simply press "S" rather than typing out "s-i-n"). This method of input allows for speedier input once you are familiar with some basic keystrokes (see below). It is also possible to use a combination of keyboard and mouse, for example you can press the keyboard SHIFT while clicking the calculator keys with the mouse. Right-click or hover your mouse over any key for function and keystroke information, as shown below. Key hint and cursor behavior can be modified from the Options Windows. The SHIFT key corresponds to [SHIFT] on the keypad. ESC or DELETE for [AC] (All Clear). Press "S", "C", "T" for Sin, Cos, Tan respectively. Press "R" for nth root function. ALT-S and ALT-R for [STO] & [RCL] respectively (see below). HOME key corresponds to [MODE]. CTRL-I & CTRL-M to directly store and recall the MEM register. LEFT and RIGHT arrows operate the [ENG] key. You can use CTRL-C & CTRL-V for copy/paste as normal. Characters inputs "* / - + ^ % ! ( )" correspond to applicable operations. Keys on the numeric section of your keyboard control the corresponding keys on the calculator keypad interface. Press TAB to toggle the key focus mode. In this mode, the key with input focus is surrounded by dotted rectangle. SHIFT (release and then) "8"
Inputs DOW (day of week - located on the  key). Releasing the SHIFT key before pressing the next key helps DreamCalc to distinguish your keyboard input properly. Often it won't matter, but in some cases keystrokes may otherwise conflict. For example, holding SHIFT while pressing "8" on the keyboard would normally input the multiply (*) operation instead of DOW, as the "*" character is normally located on the keyboard's "8" key and takes precedence. Press ALT-S and ALT-R for the [STO] and [RCL] keys respectively, followed by the key naturally representing the memory register you require. DreamCalc will know that the following key press should correspond to a memory register, rather than a function. Stores the current value to the MEM register. Recalls the value stored the E register. The following lists default input keystrokes for each function. If the calculator is in base-N mode or the financial keypad is in use, other keystrokes may take precedence however (see below). If the financial keypad is in use, the following inputs take precedence. In the base-N mode, the following inputs take precedence.